We made it home with spackle and partial sanity in hand where we eagerly awaited our departure for the airport at 1:00. 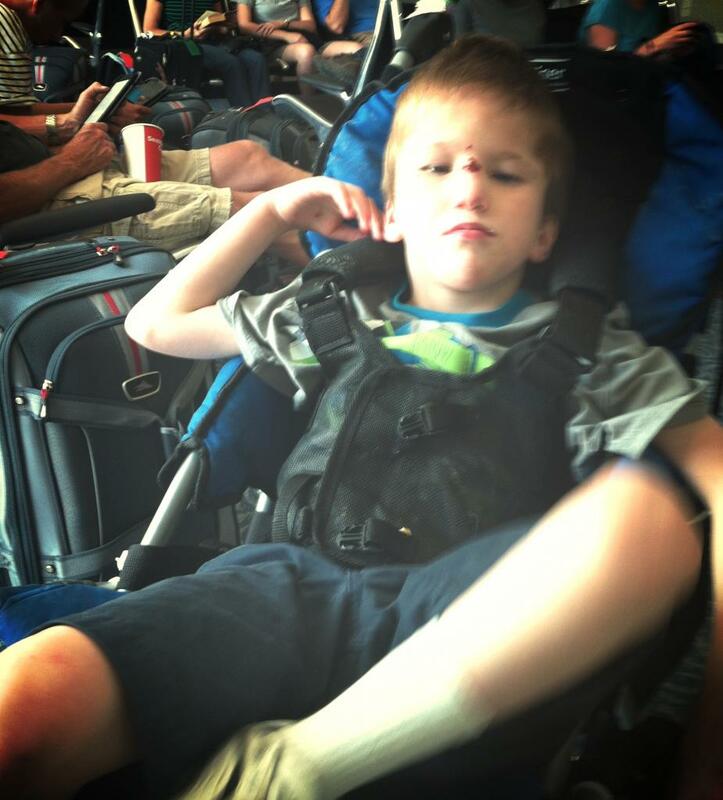 Once at the airport, I was pleased to discover that there were a few unexpected perks to traveling with a special needs child, the main perk being that I was invited to the front of the line for everything. Boarding passes, pat downs, and first in line to board the plane (which really wasn’t such a great perk I discovered once it was too late and we were comfortably seated within the confines of the plane). After my pat down, they passed on Luke deciding instead to swipe his hands with a cotton swap type thing which was met with a big smile and multiple head turns, his way of saying there was something very entertaining about this action. We easily found our gate, glanced around, and discovered two open seats in the far corner of the room. Hastily walking towards them, I tried desperately to keep Luke’s long, curious appendages at bay as we passed numerous onlookers. He has a tendency to reach out and grab anything or anyone that may hold the slightest bit of interest, especially if he happens to notice something worthy of going in his mouth, when suddenly I heard, LUCAS!!. I turned in the general direction of the voice, surprised to find that someone actually knew Luke in the airport. It turned out to be the speech therapist from his school! What a blessing, to end up sitting right next to not only someone who worked at a special needs school and would be extremely comfortable with a child like him, but someone who actually knew Luke and his odd tendencies! Thank you Lord I thought as I settled in for about 5 minutes getting comfortable with our surroundings and hoping that Luke would do the same. I began to relax the muscles in my body, breath slowly exiting my lungs as I exhaled, enjoying the peace of the moment and then it started…he began growing restless, flailing his arms, extending his legs above his head (the child is incredibly flexible), and saying, MORE!, MORE! !, MORE!!! as loudly as possible. Generally when he says this, and there’s nothing that he’s receiving in the moment, he is in fact saying, “I’m bored and unless you soothe my boredom in the next 2 seconds, I will in fact provide your environment with such a display of discontentment that you will wish that the Lord himself would return in all of His mighty glory and splendor to transport you immediately out of your current condition.” At least that’s what I imagine goes through his thought process. Out came the gigantic bag of popcorn I brought, my recent nighttime craving of Skinny Pop that I had noticed immediately before our departure and thought, that will make a clean, non – filling snack for Luke (and me) throughout the day. I began dishing it out to his eager, outreached hands, one kernel at a time, hoping to make it last throughout the duration of our day. It kept his interest for about 20 minutes and then I heard the welcoming beckon of, “Those who need additional assistance are now welcome to board.” Yay for having a disabled travel companion – we were officially Tennessee bound! I wheeled Luke up to the plane entrance to be assisted by two extremely helpful flight attendants who not only took all of my luggage and bags, but the pilot also came out and personally offered to fold up his wheelchair. I was extremely impressed with the customer service I received in Grand Rapids. Chicago would turn out to be a different story. Luke and I settled into our seats in the exit row, a wonderful perk because he was unable to bother anyone in front of him. He was fascinated by his new surroundings and was actually very entertained by the fact that he could lift the window shade up and down, over and over again, almost in effect creating his own movie by watching the comings and goings of the crew down below. The first 5 minutes this seemed to entertain him and then as quickly as it began he was over it. ALL DONE, ALL DONE, ALL DONE!! I won’t type that out as many times as he vocalized it because I’m sure you have better things to do with your day, but he probably said it about 500 times in the next 20 minutes as I sat there wincing, grimacing, gritting my teeth and praying, “Lord, please make him mute as you did to Zechariah for his disbelief, Jesus please seal his lips, just for today!” No matter how hard I mustered my faith for the miraculous to occur, the Lord did not grant my wish. Instead I received a lesson, once again, in patience and not growing weary in running my race. The plane’s engine started to rev and my sweaty palms took hold of Luke’s shoulders as we braced for take – off. We were air bound and to my absolute amazement, he acted like any other little boy, eyes wide with wonderment basking in all the whirls, clanks, and swishes that go along with a plane taking off! All in all the 30 minute flight to Chicago was a huge success. I didn’t have to resort to using my laptop nor the numerous Veggei Tales DVDs I had packed; the experience was enough to tickle his fancy for the duration of the journey. Once we landed we waited until the very end to depart having an hour to spare before our next flight, or so I thought we had an hour to spare. We arrived at our next gate with about 35 minutes until our flight to Nashville only to discover that we would be delayed an additional hour. Not necessarily the worst case scenario in the scheme of all of the scenarios in the whole wide world, but I knew Luke would get extremely antsy before the end of it all and antsy actually became a bit of an understatement. We went through the popcorn, and we tried to watch movies which he was not interested in instead his curiosity peeked by all of the buttons on my laptop which he then attempted to destroy by clobbering them with his long, saliva/salt drenched finger tips. We tried going for a walk, which was met with numerous stare downs from strangers, we went potty, in the ladies handicapped stall which was just really, really interesting, we tried gum, something Luke has never had before and was mesmerizing for him, we sang every single song I could think of, we played patty cake, we played patty cake with our feet, which he found highly entertaining, we met some nice new friends, and finally we drank lots and lots of apple juice which would prove to be very problematic in the next few hours. I smiled through gritted teeth as we loaded baggage and child. The plane was boarded, Luke was beyond over this day, and we still had about an hour in the air. I tried all of the old stand bys, movies, singing, hissing under my breath, more gum, more popcorn, more juice, and many, many, many prayers. The flight attendant filled Luke’s sippy cup initially with juice and every time she walked by from there on out, in his mind she was the juice distributor, and he would yell out, “MORE, MORE, MORE” and it was about the only thing that made the hollering subside for a bit so I kept allowing him to have more and more juice. About 10 minutes before landing, the point where I was literally counting one one thousand, two one thousand, three one thousand in my head, I smelled something – something pretty stank and nasty, something sitting really close to me, like probably right next to me. I lifted Luke’s bottom up, patted him down with my hand which lurched away when it discovered not only a sopping wet little boy, but also a sopping wet airplane chair, urine soaking through his shorts and half way up his shirt. The apple juice idea had obviously backfired on me. I did what any mother would have done in that moment, I pretended like absolutely nothing was wrong. I placed him back down upon the urine soaked seat and did my best to entertain him to the point where he didn’t notice how wet he was for the remainder of the flight. We landed, I sang a hallelujah under my breath, and we proceeded to wait until every single last person was off that plane and then I, very carefully and discreetly, lifted him up out of his seat, having him walk very swiftly in front of me while I stayed plastered as closely as possible to his backside in hopes of avoiding any additional questions or onlookers inquiries about the wretched urine smell emanating from this child. I managed to put him in his wheelchair, loaded my back up like a mule with our luggage, and found the absolute nearest bathroom possible where I undressed him, diapered him, and put his pj’s on for the night. I was exhausted at this point, near tears, so emotionally and physically drained from the day but happy that we had finally made it. I called Ryan who was supposed to be out front waiting for our arrival, and while we connected, he had to quickly inform me that his phone was dying and he couldn’t talk long. I headed towards what I thought was the entrance, by the rental cars and hotel vans, and he headed towards where he thought he would pick me up, a floor above, by the baggage claim, and Luke just screamed and screamed. He was tired, being in a different time zone, he was hungry, having only had popcorn for most of the day, and he was just sick of it all and as he screamed and as my husband called wondering where I was, and as my phone started dying as well, my sanity officially crumbled, and I just started crying, in the middle of the airport, tears welling in the corners of my eyes as I couldn’t find my husband, as my child kept screaming, as my back was killing me from being a mule all day, and as it seemed like everyone in the whole airport was staring at me. I turned to the first person I found, a gentleman, and asked, do you know where the baggage claim is? Come to find out he didn’t speak English but he did understand the word “baggage” and he pointed towards the elevator telling me to go up. I thanked him and headed up where I immediately saw Caleb and Tate running back and forth trying to find their mom and brother. I exhaled, we had been found. Once safely in the car we headed home, 90 miles away where Luke fell fast sleep. Upon our arrival at 11:00 p.m., I gently lifted him from the backseat and placed him in his familiar bed in his new room. He never stirred and in fact slept all night long and into half the morning the following day, finally awaking at 10:00 happy as can be. And that’s how Luke and I officially made the move to our new home, a sign of new beginnings and peace, in the hills of Tennessee. In the past few days I’ve heard a particular question, one laced with hope and suspense, more than a time or two, and it generally goes something like this, “So… how did Luke do on the plane ride to Tennessee?” I thought I’d just share here, on my blog, so that everyone can participate in all of the heartwarming details that surrounded that day. It all started on a hot and humid day, July the 20th, the day that Luke and I were set to depart from the only state we’ve ever called home to embark on a journey to Tennessee where we would hopefully live out our days in peace, tranquility, and happiness. Dad and the boys had left a few days earlier and were busy setting up camp at the new house while a family friend kept the youngest four over night because their beds had already been packed, planning to drive them down early on the 20th as well. 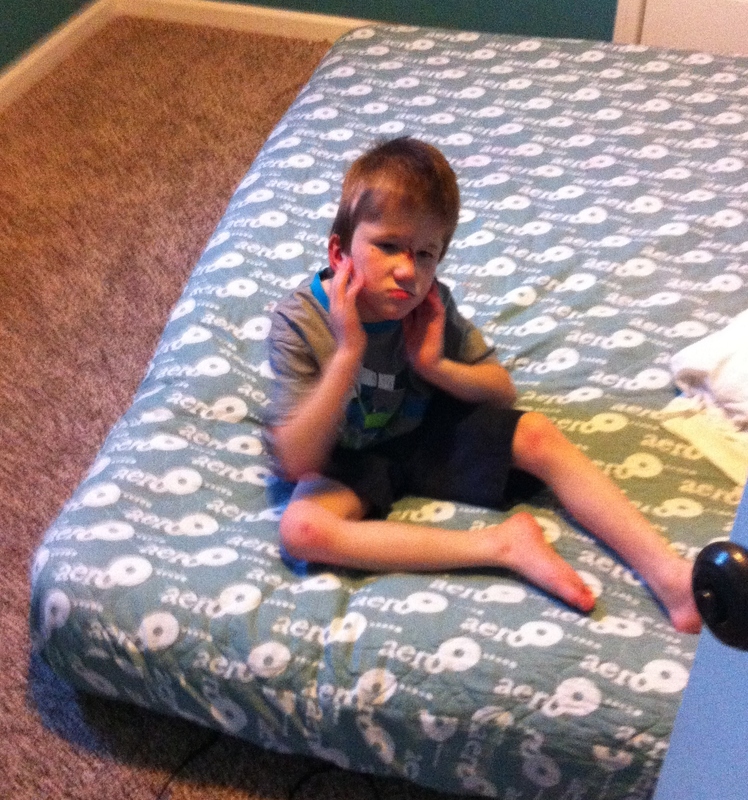 With the majority of my family gone, I was surprised at how well Luke adjusted to the silence and also the air up bed he was given as a replacement for his 6 foot tall, padded walls, full size bed that Dad had to disassemble and pack. The only issue he really had with the new bed was that it had been placed on the left side of his room and at some point during the night he decided to move it to the right side of the room. This is when something changed in Luke’s little brain, and he decided, for whatever reason under the sun, that he was done with the amount of change occurring in his life and voiced this displeasure through incessant, ear piercing, screams. Screaming about the food I fed him, the videos I played for him, and screaming about any attempt to entertain him in any sort of manner. Needless to say, he was not enjoying his existence and neither was I (enjoying his nor my own existence at this point). Many sighs of exasperation later, I decided that instead of spending valuable time packing, plastering, painting, and pulling nails, I would instead load Luke into the car and take him on a ride, a change of scenery sort of idea, and we would, in the process, stop at the hardware store to pick up a few items. This was a good idea for the 20 minute drive to the store while Luke sat quietly, looking out his window and singing along to the songs on the radio. HOWEVER, when we arrived, I sat in the parking lot of this store and contemplated my options, for about 10 minutes, as to whether or not it would be a wise decision to actually bring him INTO the store where there would be real, live people; nosy people staring at this child who has absolutely no inhibitions whatsoever and after being his mother for 8 years, I have very few inhibitions or pride left as well, so the two of us combined in this store together could be trouble. My carnal reasoning went something like this, “He is eight, I would leave Mya in the car alone to run into the store, but he does have the mental capacity of an infant, but I could lock the doors, but then what if for some reason I can’t get back in and then he’s locked in the car and there aren’t any videos, just the radio, but if I bring him into the store it could be a nightmare, and how am I going to put him in the cart? I forgot his wheelchair, hmmmm” and then an elderly couple pulled up right beside me in a polished, tan Oldsmobile, both smiling in a sweet elderly way as they noticed my special boy sitting in the back seat, and then I immediately, in my thoughts, recalled stories of people calling social services on mothers in Walmart parking lots who left their offspring in the car. This is an extremely flexible, skinny, little boy, but it was quite the maneuvering job trying to get his legs into those shopping cart holes. Jamming, coaxing, and coercing, I finally managed, and we walked towards the entrance, ignoring confused looks of, “Isn’t that boy a bit old to be sitting in that cart?” and me singing, very quietly under my breath, one of his favorite songs, “Jesus love me, this I know” as I walked through the sliding doors which beckoned my entrance with a bold welcome sign, I frantically did a 180 head turn around the store, glancing up and down, left and right for something pointing me in the direction of the paint section, heart rate rising with every moment, hands getting balmy, and sweat forming along my hairline, bracing for what I knew was coming, very, very soon, a vocal, very repetitive, very intense hollering of “ALL DONE! ALL DONE! ALL DONE!” Luke, in general, has a very low tolerance for anything resembling patience. “This little light of mine, oh my word, this is so stressful and I’m sure not letting it shine….” I sang quietly under my breath. Ma’am, Can I help you? HALLELUJAH! “Swing low, sweet chariot coming forth to carry me home!” As I realized that the cashier was speaking to ME and that meant I was almost free from the confines of the store, the shackles of any pride I formerly possessed slowly disintegrating as I eyed the exit door with intense anticipation. YES!! Luke darling, we ARE almost all done, big fake smile plastered across my lips as I pretended in that moment to absolutely adore spending time with my son in the hardware store. I smacked the can of spackle on the counter, frantically counting out 7 dollars and 57 cents, shoved it in the clerk’s hands, and proceeded to walk, very, very quickly out of the store as the ALL DONES!!! continued to increase in volume, intensity, and speed. Once outside, I felt like a prisoner, freed after years of being pent up in a prison cell, feeling the warmth of the world gently touching my face for the first time as I finally breathed a sigh of relief, my blood pressure levels started to slowly subside and my breath returning to normal paces. I rapidly turned, half expecting the police’s arrival to take us away for disturbing the peace. Yes, that is how frazzled I was. Thank you I muttered, taking hold of the brown paper sack holding the precious spackle purchased with not only money but also with a voluntary offering of my sanity as I surrendered to the absurdity of the moment, trying to hide the red creeping up my neck line, slowly inching its way towards my cheek bones. I’ve been a little busy lately and recently had the pleasure of reading a post on a blog that I really enjoyed. It lined up exactly with my philosophy of “just keep livin!” and it came from my new friend Kate, who I was very sad to leave behind in Michigan, but I am convinced that we will stay in contact for years to come. She has lived right down the road from me for years, our paths taking eerily similar journeys through the deaths of our late husbands, left widows with four young children, and both of us recently remarrying to become moms of 7 children! I hope you enjoy her “kind of crazy” as much as I do. Several things lately have come up prompting me to once again grapple with the reality of choosing Joy or choosing bitterness in the midst of setbacks, struggles and sometimes downright painful experiences. I had a conversation recently with a good friend of mine about the struggles her and her husband were going through, they have been trying to sell their home for a very long time now, with no success and had just learned that their last attempt to have a child had failed. All of this was met with a heart wrenching, outpouring cry of “why?” Why me, why us, why is God’s answer no when we’ve been praying so long and so hard for this. Her pain is real, and in the middle of this right now, she is truly struggling with anger, anger at the situation, but also at God for his answer of “no”. Then last night, after weeks of helping her pack up her home, I and my family said goodbye to my mother as she is moving to California where her future is uncertain as she battles liver failure and waits for her health to decline to the point where she is sick enough to receive a new liver. We do not know when we will see her again or what state she will be in when we do. We have prayed for years as a family for some miraculous healing to occur, to take away this disease which robs her body of strength and health and is in fact killing her, but the answer has been “no”. Four plus years ago as i was faced with a very uncertain future as a young widow with four very small children looking to me for the answers, i asked “why”, screamed it in fact, more times than i can count. I raged and wailed, i struggled at the deepest parts of my soul to understand and reckon this situation God had placed me in. I fought it, I raised my proverbial fist in the air and begged to know how this could happen. Then after a year, yes a year, i asked a group of pastors a pointed question. I asked if it were possible to be content in the situation as God calls us to and yet still struggle with being angry. The answer, “no”, it seems logical, however when you are in the middle of it, logic can sometimes have nothing to do with it. This answer of no propelled me though to the place where i realized that i was choosing anger and bitterness, i wasn’t seeking joy and living in the peace that God offers so freely. From that day on, i decided to choose joy. This joy doesn’t mean that we never have moments of anguish or sometimes still ask the why’s, but it is a purposeful decision to find joy and contentment despite and sometimes right alongside of the pain. This is the answer i gave my friend as she asked me “what do i do?” I gently in love told her to cry and scream, ask the why’s and then choose joy, choose to embrace the peace God is offering through the pain. This is the answer i gave my kids who cried themselves to sleep because their Nana had to go away, I told them to let the arms of Jesus come around them even though it hurt, because the God who loves them, loves their Nana even more than they do and He has it figured out. This is the answer i give anyone who is struggling today, We may not know the answers today or maybe even ever, but the God of the Universe who loved me enough to send his son to die for me, loves me enough to know the plans he has for me and will provide peace and joy when we seek it. The past few days I’ve been wondering when the human body and mind finally cross that very fragile line of extreme exhaustion and enter a state of complete insanity. I think I may be getting to that point if we don’t slow down soon. Last Tuesday Ryan spent the day and night frantically working on his two flip houses, trying to wrap up loose ends before the move. The kids and I spent the day packing like maniacs trying to surprise dad when he came home later that night. 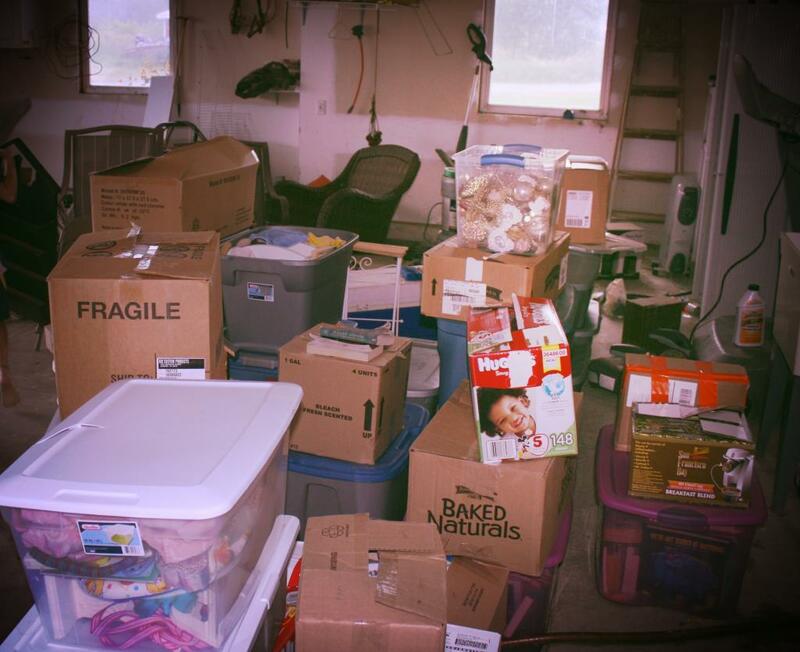 We managed to pack the garage full of boxes. It was actually a really rare (lately) joyous time for me with the kids. I gave them all a pep talk about how exhausted dad was and how we could be really helpful to him by pulling it together as a family and busting through some chores. The boys unscrewed everything and took pictures down from the walls while the girls packed and cleaned. Funny, in the middle of it all, it started down pouring outside, and the girls and babies ran out to dance in the rain while I snapped pictures, being once again reminded that life does bring seasons of rain but the sun always shines again. I decided to surprise Ryan on Wednesday and hired a babysitter for the younger kids so that I, along with Tate and Caleb, could offer our services and be at his beckon call throughout the day. The three of us went to one of the flip houses where we picked up trash, mowed lawns, bought appliances, swept, cleaned, and scrapped this awful crap off the basement floor for hours so it could be stained later. Tate asked a very intelligent question in the middle of our third hour on our hands and knees, making very little progress with this stubborn, sticky stuff, “Why doesn’t dad get an easier job like working at Lowes or something?” Honestly, I was thinking the same thing in that moment, but we all put our happy faces on, possibly somewhat fake, and proceeded to grind through. The boys were rewarded with unlimited video game playing time when they got home that night. I also discovered earlier in the morning that the garden had yielded a huge crop of beans, almost overnight, so I had the girls pick them, and then put Mya in charge of the “cleaning and snapping beans project,” overseeing the little ones. I mentioned to Ryan later that evening how excited I was over how Mya has blossomed, almost overnight, from this child who desires to help with everything, being somewhat helpful but not really all that helpful as I have to hold her hand through most tasks, into a genuinely helpful person who just owns the task and completes it with very little direction or supervision. I didn’t have to remind her about anything with the beans. She took the whole pile of them out to the deck, snapped bottoms and tops, broke them in half and proceeded to share her wisdom with Josh, Jada, and Mabel. YAY for me! Thursday through Monday Ryan and I said goodbye to the kids once again as we made our last excursion to Tennessee without them. We brought the boat down, one car, and a trailer full of stuff. I don’t get overly emotional about many things, in fact, I usually tear up one day a month, usually occurring with undeniable accuracy according to the hormonal shift arising in my body, but as we pulled away this time, 6 little ones running after the car, waving frantically, I chocked down a lump in my throat. I miss my kids. On the flip side, Ryan and I have spent a WHOLE LOT of quality time together. We spent our days and nights unloading, painting, tacking, priming, and working to exhaustion every night and then falling into bed only to get bitten all night long by mosquitos. I almost felt like we needed to sleep under a mosquito net. I also had the job of picking out knobs for my kitchen cupboards. This, in the past, has proven to be an insurmountable task for me for some reason. I had about 15 choices from Hobby Lobby, narrowed down to about 10, then the final 2, and then I actually choose the winner. That is until I went to Hobby Lobby back here in Michigan, a different Hobby Lobby than I usually go to, and found two more options. So now I’m down to the final three. Stay tuned…. My husband paid me a really nice complement as we worked our rear ends off saying he’s never met a girl who worked so hard at manual labor and how I could be a really strong asset for him if I wanted to go into flipping houses. I thanked him kindly and then very wholeheartedly declined his offer – 7 kids, household duties, and mosquito prevention methods will probably be adequate in filling most of my days at our new house. Tuesday, we headed home, exhausted and excited to sleep in our own beds. I spent most of the 11 hour drive home hacking through my “to do lists” and Ryan drove. As we pulled away from our new home sweet home, I snapped this photo of a little guy sitting on my husband’s shoulder. Would have been cuter if it was a lizard or something, but I guess he attracts moths while I attract mosquitos… Now we need a moth prevention program as well. Wednesday was pick up the u haul day. We had a few friends and my aunt and uncle come over to help us load up. This day was intense. We loaded, ate on the floor, and sweated like pigs in Michigan’s insane 90 plus degree days of total humidity.